Our industrial pneumatic brakes, also known as air brakes or hydraulic brakes, are often used in positioning and holding applications, and are ideal for indexing. Many of our pneumatic brakes offer bi-directional operation and can operate in wet and dry environments. With torque ranges from 5-500 lb. ft. (torque depends on model), we likely have a pneumatic brake model that will fulfill your needs, though customized brake torque options are also available. For more information on designing your industrial air brake please visit our clutch and brake guidelines. 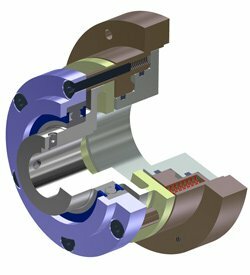 If you don't see the part you need here please contact us – many of our industrial hydraulic / air / pneumatic brake models do not appear in our standard catalog, and all of our brakes can be customized. 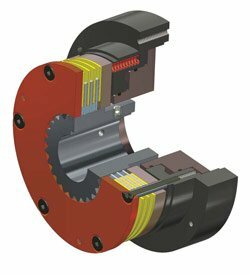 Our experienced engineers are ready to design and manufacture the custom industrial brake you need, or build a complete power transmission system. Carlyle Johnson works to ensure our pneumatic brakes provide a long operational life and deliver the best return. We repair and perform maintenance on all of our parts, quickly returning serviced industrial brakes to you. We also routinely upgrade, retrofit and overhaul components, extending life spans or repairing units that are no longer available for replacement.